Books 1-3 of the Xoe Meyers Series. A demon’s life is never easy. 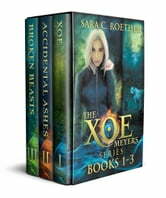 Join Xoe as she’s thrown to the wolves, the werewolves that is. As if witches, human sacrifices, and other demons weren’t enough to deal with, Xoe must struggle to rein in her powers before she sets something more important than a washing machine on fire. If she can’t, her whole life might go up in flames. Very well written. I didn't want it to end. Even though it has a YA classification, it held my interest. Throughout. This book had me turning page after page till I finished the last page. Riveting Couldn't put it down. Read all three in 2 days. Even though she was young the maturity which she had was wonderful.